The Google Hangouts app for iOS just got a lot better, especially for those in the US who can now make free phone calls with the all-encompassing, multi-platform messaging and video chat application. A new update arrived on Friday, essentially folding in Google Voice functionality and thus allowing users to make free calls to anyone in the US and Canada, and cheap calls internationally. 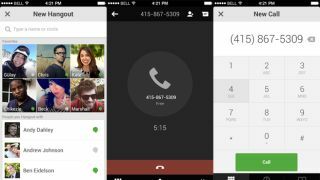 Outgoing calls will come from the user's Google Voice number and incoming calls will be received through the Hangouts app. That feature isn't even available within the Android version of the app yet. Unfortunately for Brits Google Voice has never made its way across the pond, but fear not there are a few other improvements for users to enjoy. Namely, Hangouts will no longer halt music when incoming messages are received, which had proved a serious annoyance for some users. "Incoming messages will no longer stop your music. Instead of interrupting your groove, Google+ Hangouts will now temporarily duck your music, then crank the volume back up," wrote Kate Cushing on her Google+ page. The app update also sees the return of the green, orange and grey circles next to contacts to indicate who's available and who is idle or offline. And, perhaps most importantly, animated .gif files will now play in-line within conversations. Thank heavens for that.